T hese small, fertile islands near to the equator are a perfect destination if you want to have a break from travelling on the main land of Africa. This could also be a good choice, if you just want to go to a less frequently visited African country for a few weeks. Until 1975 Sao Tome & Principe was a Portuguese colony, mainly used to produce coffee and cacao. Shattered over the country, large colonial buildings where the centre of coffee/cacao production. White Portuguese families inhabited these so-called roças. Small huts and houses of the slaves who did the real work surrounded these buildings. The slaves were mainly imported out of Angola, Mozambique and Cape Verde. At the end of the 19th century, Portugal was pressured by other countries to abolish slavery. In response, Portugal introduced “the contracted worker”. These “imported workers” were forced to sign a contract that they could not understand. This contract legitimised to deal with these workers as if it were slaves. For instance, if a contracted worker tried to escape from the plantation, they where punished fiercely (torturing was no exaction). Therefore, the “contracts” were a facade that enabled Portugal to let slavery exist for many years. In 1975, Sao Tome was one of the last Portuguese colonies that became independent. Still, the recent history of colonisation and slavery is visible on the island. In fort São Sebastião in Sao Tome city, a museum gives some insight for the ones interested in this history. The exhibition reveals the relations between the slave and his master using pictures, paintings, examples of rooms where people lived and the accompanying household goods and instruments. Slaves living in small hovels, masters living is luxurious suites with beautiful diner sets decorated with the logo of the concerning roça. The masters sitting on a nicely set table, while the slaves had to wave with large screens to bring some cooling to their masters. This is a Rolex Daytona model 116520 with black dial. It’s a 2010 “V” series and this watch has never been worn; it comes with all the original boxes, papers and warranty card. Everywhere, you will see beautiful colonial buildings that mostly are not so well maintained. It seems that most buildings aren’t maintained since 1975 because there where other priorities. Some old roças (e.g. Roça Bombai Roça de São João dos Angolares, Chamiço) are now rebuilt as hotel and they are often a nice and atmospheric place to spend the night. Usually, you can have diner there, although sometimes you will have to order in advance. Food is simple but nice and fresh. A standard meal in a low-end restaurant contains of nicely seasoned, grilled fish with fried bananas, salad and some fruit as desert. This all is washed down with a nice cold beer. After dinner, lots of people gather in one of the bars or restaurants to watch some Portuguese football. Learn more about organic coconut oil! Yet, Sao Tome & Principe has a lot more to offer. The islands are covered with a beautiful thick jungle. This jungle surrounds remarkable black, high rock formations in the form of pillars that rise up into the sky out of nowhere. The islands have “picos” (peaks) over 2000 metres where you can do some great tracking. The jungle reaches almost until the sea. The beach forms the only separation from the sea. There are all kinds of beaches: black sandy beaches, gravel or rocky beaches and the white sandy beaches. All have one thing in common; they are all situated with a background of jungle or plantations with a lot of palm trees so it really looks like Paradise Island. So, if you need some cooling down just follow a path in the direction of the sea and be surprised of the nice place where you will get. Nearly all the time, you will find a quite beach where you can enjoy and relax a bit. The beaches are mainly used by fishermen and people having a rest from their work on the plantation. They pick a coconut, and chop it into pieces with their machete (which is carried by almost everyone) and they take some time to relax. However, the most important visitors of the beaches are the children. Even though you are on a seemingly deserted beach, after a while a group of children will show up to have a chat with you. They love talking to you and like to show you how you pick coconuts and which berries in the jungle are eatable. They are curious about the visitors on their island and they love to be with you some time. You will run into children everywhere. If you are hiring a car for some days to explore the island, don’t be surprised if some children jump on your back bumper to get a free ride. If you visit a roça they will show you around and you will see them playing with improvised self constructed toys. With a few pieces of wood and some home made wheels they make small carts to race of the hills. An old shoe is vitally important to bring the cart to a standstill, and they have a great time. Sao Tome & Principe are utterly relaxed islands. When flying from Sao Tome to Principe, then you go to the national airport next to the international airport. This is a ramshackle building with only a desk and a balance to check whether the total weight of the baggage can be lifted off by the Twin Otter. You hand in your ticket and then you will sit nice and easy next to the airstrip. There you will see the schoolchildren walking on the airstrip in their uniforms and with their schoolbooks under their arm, and everywhere are chickens and pigs crossing the runway. After a nice flight of 150 km you will land on Principe. Principe is an even smaller island, with even less visitors. Most people coming to Principe will only see Bom Bom island resort while this island also has great hiking and biking possibilities. Both islands have lots to offer, with everything on a short distance. If you want to climb a pico, just ask someone that walks into the same direction to show you the way. Off course, you can try it yourself but the jungle is thick and most pathways are overgrown or ruined so it is not easy. People are very helpful and like to get to know you. If you want to thank them for a day of guiding, while clearing the paths with their machete and explaining things about the jungle they like to have a drink with you and after some instigation they are very happy with a small compensation. 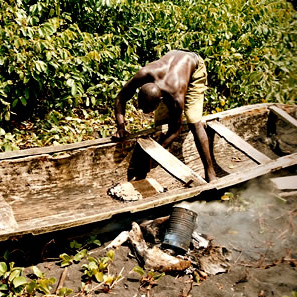 It is just the same, if you like to do boat trip with one of the fisherman in their pirogue. Just ask them and it will be arranged. Sao Tome & Principe are beautiful islands, and although they are small it has something for everyone’s taste. People are very friendly and helpful and love to explain things of their island. Despite the poverty, the jungle and the sea produce. Sao Tome & Principe are islands that deserve to be discovered.